If you’ve got a couple of 3″ thick rib eye steaks that you want to fancy up because you’ve been eating grilled steak every day for weeks, you may want to stuff them – and we recommend making it count, spice-wise. 1. Let steaks warm to room temperature. 2. Dice jalapenos, garlic, and mushrooms. 3. Slowly braise with butter in fry pay until reduced and brown. 4. Using sharp fillet knife inserted through single hole, cut a deep and full pocket in the steak without cutting through the sides. 5. TIP: When fat separates the steak meat, create a separate pocket in the other piece of meat from the opposite end. 6. 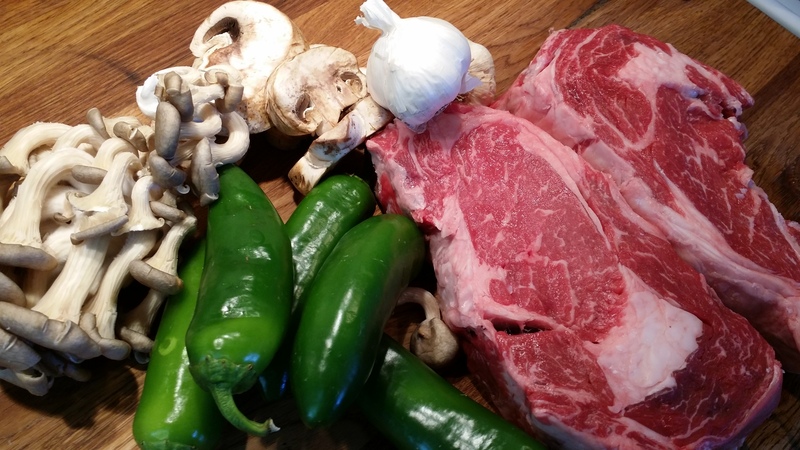 Using mainly your fingers, stuff the steaks with the jalapeno mix. You may want to consider using rubber gloves if your jalapenos are really hot. 7. Grill to medium rare over hot charcoal with frequent flipping. The warm stuffing will reduce your cooking time compared to non-stuffed steaks, so don’t wander off. Even if you’re not tired of grilled steak yet, this is probably worth the effort.